The machinery of various agencies in the City of Trees is working to help make a stadium a reality. But one detail has largely been papered over: How will it be paid for? During Thursay’s State of Downtown Boise event, a short panel discussion was held on the stadium idea – and BoiseDev.com has obtained new documents that help illustrate the possible path forward. Top line: Greenstone Properties buys the land from St. Luke’s. Greenstone donates the land for the stadium. 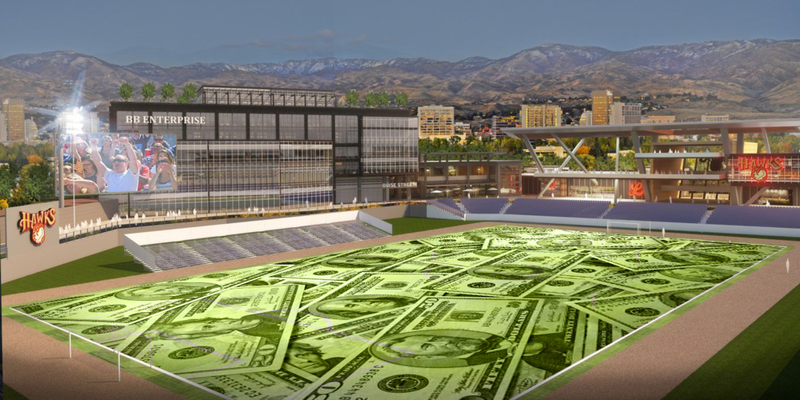 CCDC/GBAD/City of Boise pay for the stadium, and some public agency owns it. Greenstone builds offices/hotels/retail around it. Tax values go up and it pays for the stadium. That’s the idea, at least. Say what now? The mayor claims that public funds would be used – “We anticipate some city capital and some auditorium district capital in the mix.” In addition, the Capital City Development Corporation is working to create a new urban renewal district in the area around the stadium. The hope is that the stadium will anchor a development and attract additional investment in the area – raising property values and bringing more tax dollars in. Shorter: CCDC creates a district and collects the increased taxes that could come from increased property taxes around the stadium. In anticpation, they take out a bond so the cash can be put up right away. Who owns this deal? A public agency. But which one? Unclear. CCDC says the stadium has to be owned by some public agency — but the draft term sheet says it would “not be responsible for any operations, management or programming.” CCDC says the developer would have to donate the land under the stadium for the project. Is GBAD good for this? That seems to be the idea. Bieter mentioned that agency Thursday – and the CCDC doc mentions that the auditorium district could contribute $5 million of its funds to the stadium. In a Tuesday election, Bieter helped replace a foe with a friend on the GBAD board. Timeline: The CCDC district could get finalized this year. GBAD would also have to figure out how to fund the piece it is expected to contribute. Chris Schoen with Greenstone Properties, which is the developer on the project, said he wants to move fast. “The goal is to be able to break ground 12-18 months from today. It would take another 16 months to build. We could be ready for soccer in the 2020 season.